MAKING THE CASE FOR LIBERTY. I love the Independence Day holiday. I started the day by reading online "Common Sense" by Thomas Paine. What a succinct, pointed, powerful statement of the case against the monarchy and England's treatment of the American colonies! He lays out the arguments for independence and democracy so well, it is no wonder Paine's tract convinced colonists who had been riding the fence up to that point in time. A strong case for the power of the printed word. DEPENDENCY. Given my currently relatively immobile and dependent condition (it's been two weeks since the accident), I mulled over the distinctions between dependency, independence, and interdependence. Most of us don't think of dependency as a necessary thing in certain situations. Children are dependent, but the purpose of this necessarily extended dependency (longer than any other species) is to move them beyond it in a healthy way. Dependency, carried beyond necessity, can breed unhealth. We describe unhealthy relationships or family systems as codependent. I am currently dependent on a narcotic to help me cope with pain. I am less dependant than I was a week ago and I hope to be independent of this now-necessary aid as soon as possible. INDEPENDENCE ISN'T THE GOAL. My goal is not simply to become or be independent or self-sufficient. Often portrayed as the ultimate goal of freedom, democracy and a capitalist economy, independence is a means to an end, not the end itself. That is the myth of rugged individualism. Those who proclaim they are "self-made" people are very short-sighted and arrogant. The most vociferously independent person you know is vastly beholden, whether he or she is able to see or admit it or not. Beware those who claim self-made status and independence; such people may also act as economic and social predators. They tend to live privately and "independently" at everyone else's expense. RECOVERING INTERDEPENDENCE. We were not created to be independent. We were created to be interdependent. We are at our best when we use our capacities freely to help one another. Freedom's purpose is to better the community. I move from dependency to independence to contribute to the common good, to serve others in their move out of mere dependency. Interdependence is the path toward the shining city. This is a critical and ongoing issue in our society, one that Robert Bellah has so eloquently documented and described in Habits of the Heart and The Good Society. BALLGAME & FIREWORKS. I've been going a bit stir crazy, limited in my mobility as I am, so my family loaded me up in the car and we went downtown to take in an Indians baseball game and the July 4th fireworks this evening. My back brace enabled me to sit through the game (it included four home runs, two caught by the same fan!) and enjoyed the fireworks afterward. The excursion exhausted me and made me sore, but I considered it worth the effort. We celebrated America's 231st birthday with our fellow citizens. 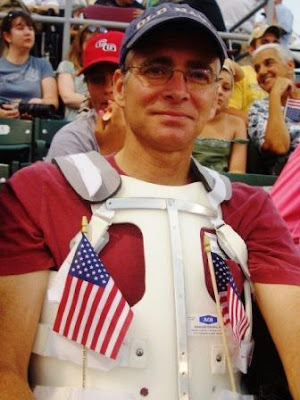 Photo: Molly took this photo of me in my "Yertle the Turtle" back brace, decorated for July 4th with flags, at the Indians baseball game.